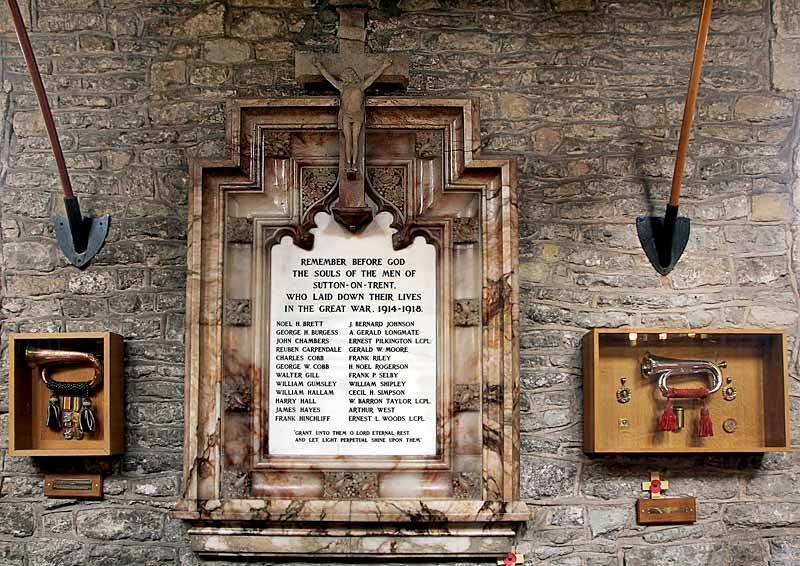 The main lists of those who fell in the two World Wars are to be found on memorials in the church, where there are also some other commemorative plaques relating to the British Legion and two bugles and medals donated to the church. In the churchyard, the lych gate (c1920) also serves as a memorial for World War II. 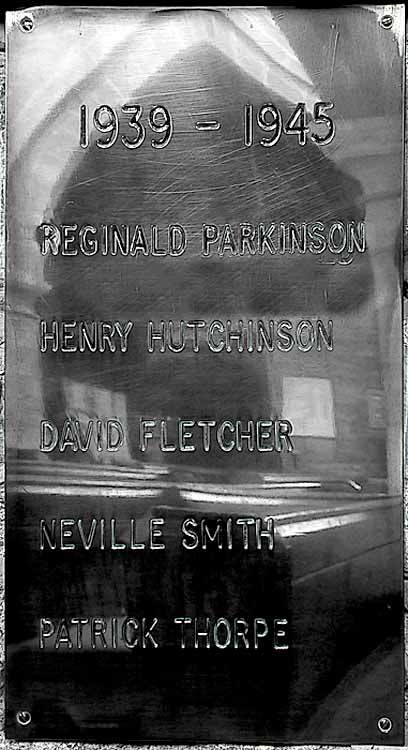 A smaller version of the World War I memorial is to be found in the Methodist church. 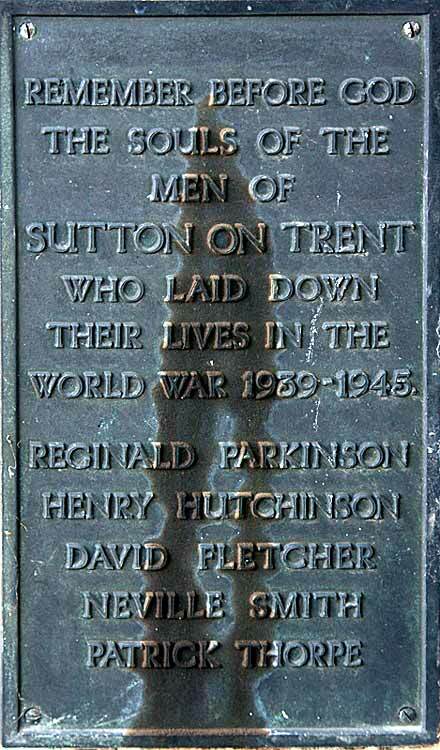 A Roll of Honour listing all those who served from Sutton (145 men in total, with three additional names of those discharged) and also including two women, Lily Hutchinson (WAAC in France) and Winnie Selby (VAD in France) can be found in Nottinghamshire Archives (PR 7343). 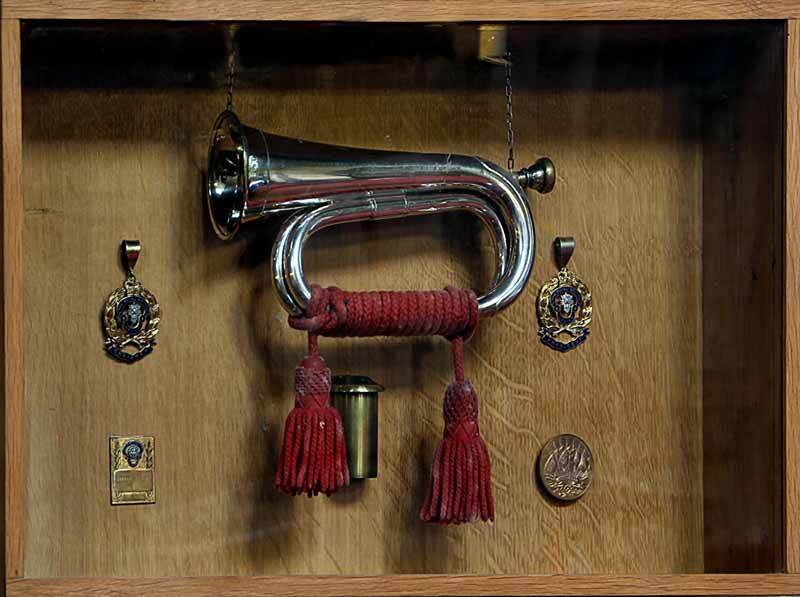 It notes those who were killed, missing or taken prisoner. 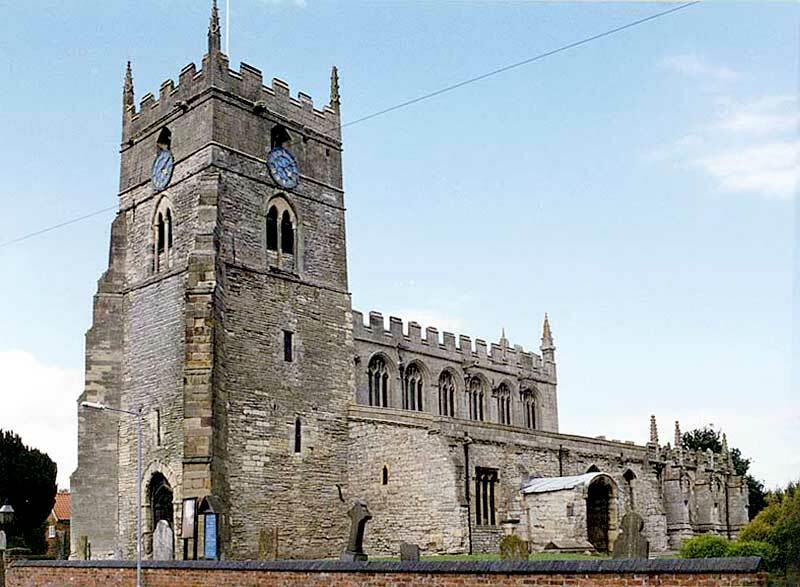 The parish church register of burials shows that funerals were held for two men who died from their wounds (Ernest Leopold Woods, place of burial not stated but probably Sutton, and Gerald Moore, who was buried at Sutton). 1. 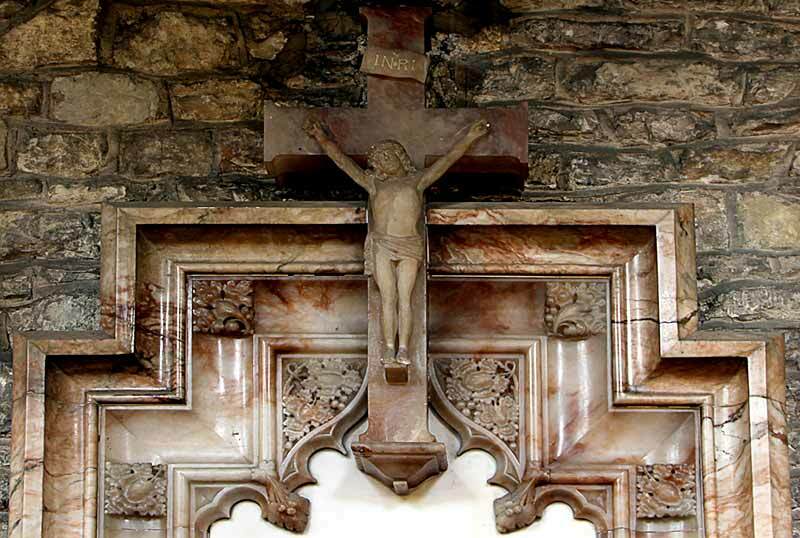 Large shouldered white alabaster memorial tablet, incised with black lettering, mounted on wall, within a multi-coloured surround, with a small statue of Christ crucified. IN THE GREAT WAR, 1914-1918. AND LET LIGHT PERPETUAL SINE UPON THEM. Rev. 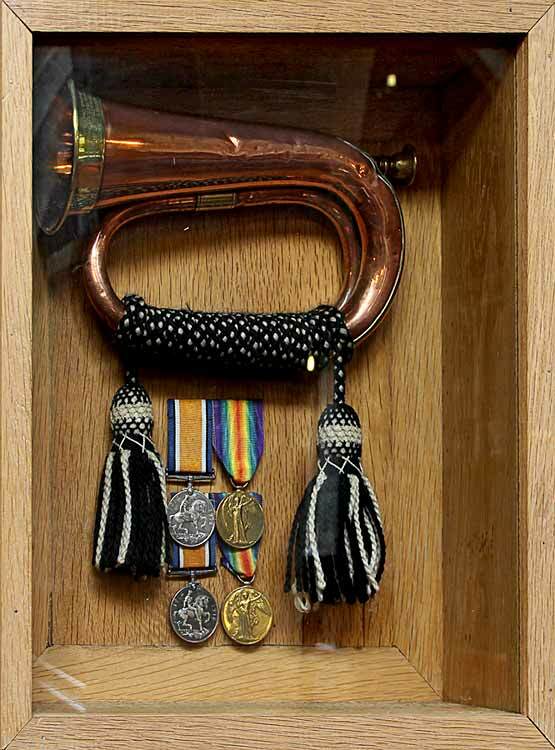 Leo Warner, former Branch Chaplain in 1968, the Bugle having been brought back from the Somme. Longest serving Branch Member, were presented to the Branch by his family. 5. 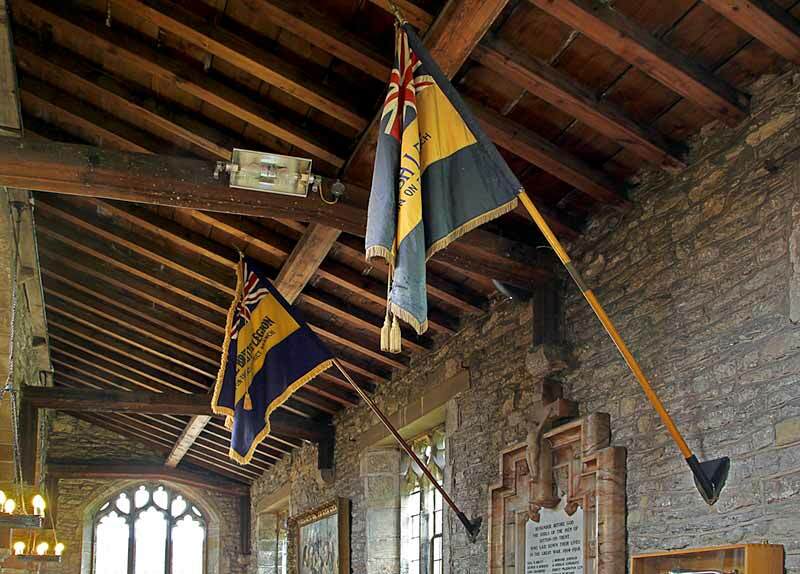 Above 3 and 4, and to the left and right of the main memorial (1), two banners of the Royal British Legion, Sutton on Trent & District Branch.